Couple on a scooter make instant selphie photos. 4k00:22Couple on a scooter make instant selfie photos. 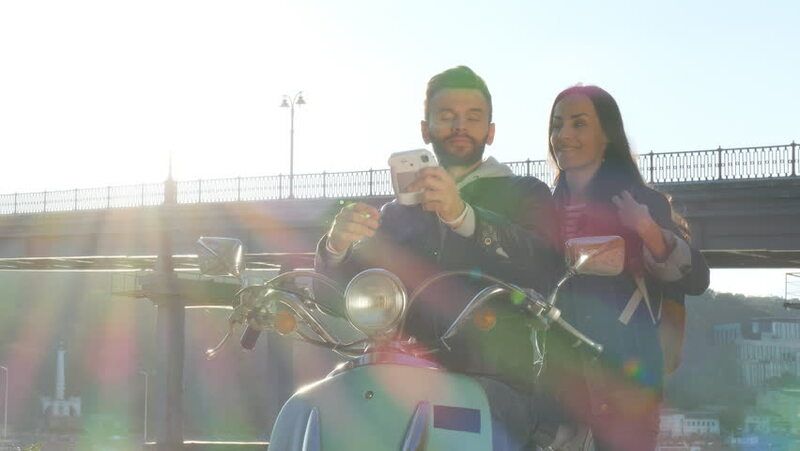 4k00:16Couple sitting on the scooter and taking selfies on the snapshot camera. hd00:25Beautiful young asian woman using smartphone enjoying reading social media beside fence at river. hd00:13Portrait shot of four stylish friends using map for choosing right way in mountain on the sunlight background. hd00:08Happy couple riding a scooter in the forest. Sunny beautiful day. hd00:11Happy couple flying a kite on a green lawn in the park. hd00:10Happy couple flying a kite on a green lawn in the park. hd00:13Happy couple flying a kite on a green lawn in the park. hd00:16Happy couple flying a kite on a green lawn in the park. hd00:17Happy couple listening music or watching video in the park. 4k00:18Happy couple listening music or watching video in the park.